The smallest but most widespread of the five loon species, the red-throated loon is one of the northernmost aquatic birds in the world. An easily recognizable member of the Gaviidae family, these are familiar birds to birders who are lucky enough to see them, and this fact sheet shows just how amazing these distinctive birds can be. These birds are instantly recognizable as loons with their long, stout, very slightly upcurved, grayish-black bills. Males and females are similar, though males tend to be slightly larger and heavier than females. In breeding plumage, the head is solid gray and the long neck has fine, vertical black and white streaking on the back of the neck and a bold brick red patch on the throat. The breast and underparts are white, though some light gray mottling may show on the flanks. The back and wings are dark with very slight gray mottling. In winter, non-breeding plumage, these loons have a white face, throat, and underparts, a dark hindneck, white speckling on a black back, and a paler bill. Throughout the year, the eyes are red and the legs and feet are dark. Juveniles are similar to winter plumage adults but show more gray on the sides of the throat and a much paler bill. It can take one to two years for young red-throated loons to reach their full adult plumage. These birds have a deep voice that includes a somewhat musical croaking duet, wailing calls, a throaty quack, and deep growling or grunting vocalizations. Young loons also have begging calls they use to get adults' attention. These northern loons have a circumpolar, worldwide range and are found on tiny, relatively shallow ponds, lakes, pools, and bogs during the summer breeding season. In winter, they prefer shallow coastal waters such as harbors, bays, and estuaries, though they will also venture out to sea. These birds' summer breeding range includes Arctic areas of both North America and Eurasia, including Iceland and Scandinavia. In winter, they are found along the oceanic coasts of Europe as far south as Spain and into the Mediterranean Sea and Caspian Sea. In Asia, wintering red-throated loons may be seen along the coasts of Japan, the Korean Peninsula, and as far south as northern China. In North America, the winter range extends south to the northern Baja Peninsula on the Pacific coast and to South Carolina on the Atlantic coast. Vagrant sightings are rare but have occasionally been recorded inland, particularly during migration. These loons are rarely recorded much further south than expected, including in northern Africa, central Mexico, and Mongolia. Red-throated loons are generally solitary but may form flocks during migration or in suitable areas during winter. Their flight path is straight and direct with deep wing beats, and they show a distinctive humped or hunched profile in flight with both their feet and necks drooping, though they often move their necks up and down while flying. These birds are awkward and clumsy on land but are excellent swimmers. They often hold their bills slightly pointed up, and they can take off directly from the surface of the water or from land if necessary without a "runway" stretch to build up to flight speed. These loons are piscivorous and eat a range of different fish, as well as aquatic insects, amphibians, crustaceans, and mollusks. As agile divers, they may descend up to 90 feet deep in pursuit of prey, which they will swallow whole. These loons are monogamous and form long-term bonds that may indicate mating for life. Courtship displays include dipping the bill into water as well as short rushing dances and diving near potential mates. After mating, both partners work together to build a shallow scrape nest or low mound of grass, moss, wet vegetation, and mud, and it may be lined with finer materials or a few feathers. There are one to three oval-shaped eggs per brood, and the eggshells range from olive-green to deep tan and are splotched or slightly speckled with darker shades. Both parents share incubation duties for 25 to 28 days, and the precocial chicks leave the nest within a day of hatching. They are able to feed themselves, but the parent birds will supply easy food and ongoing guidance. If the chicks are threatened, the parents may perform elaborate distraction displays to dissuade predators. The young birds take their first flight when they are 50 to 60 days old. Because of the long care period, a mated pair will only raise one brood per year, though if the nest fails early in the season, they may begin a new brood at a new nesting site. While these loons are not considered threatened or endangered, certain populations are declining as Arctic regions are under development for industrial use and local threat classifications may vary. Oil spills and other pollution are also a threat to red-throated loons, and gill nets and irresponsible fishing techniques can take a heavy toll on these loons, particularly in their winter range. These are not backyard birds but may appear in unexpected areas with suitable open water, particularly during migration. Habitat preservation and healthy aquatic prey populations are essential to make red-throated loons feel comfortable. Visiting suitable coastal habitats in this loon's range is the best option for birders to add the red-throated loon to their life list. Because this bird breeds in Arctic regions, visiting Alaska, Scandinavia, Greenland, or similar northern areas during the summer can lead to good sightings of the loon in its distinctive breeding plumage. 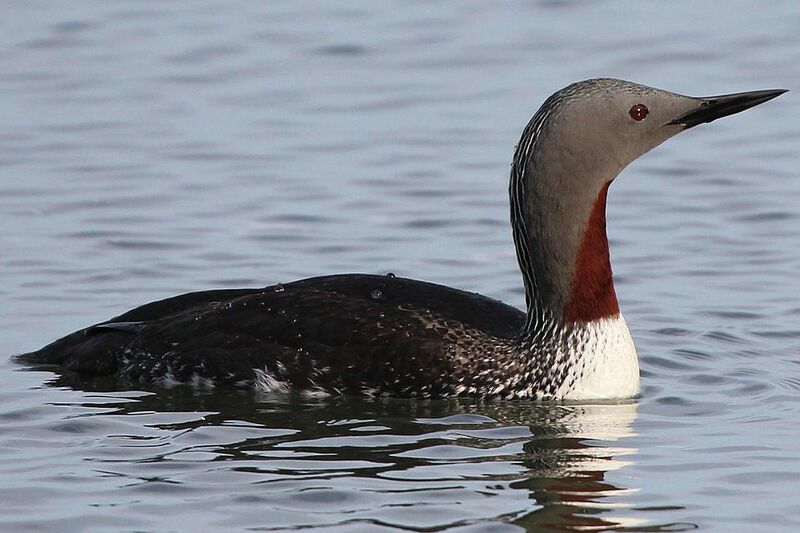 Birders can also see the red-throated loon in its non-breeding plumage along more southerly coasts in winter. These loons are also regularly seen in the Great Lakes region during their migration movements. Be sure to investigate more great bird profiles to learn even more about your favorite species!